Gold catalysts supported on nano-crystalline ceria prepared by deposition precipitation have been characterised and tested for the total oxidation of naphthalene. Two different precipitation methods were used to prepare the nano-crystalline ceria supports and it was observed that although both supports were active materials for naphthalene oxidation, ceria synthesized by homogeneous precipitation with urea was markedly more active than CeO2 precipitated by carbonate. 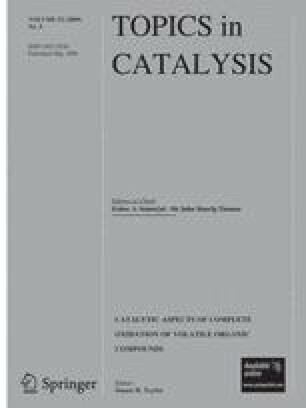 The addition of gold to both active CeO2 catalysts resulted in different effects for the total oxidation of naphthalene. Gold addition promotes the naphthalene conversion to CO2 when ceria is prepared by precipitation with carbonates, whilst the light off temperature is shifted towards higher temperatures when gold is added to ceria synthesized by the urea method. This behaviour has been related to a change in the support characteristics and a removal of the carbonate surface species, when gold is deposited onto the ceria support.